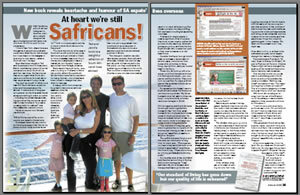 Authors Ted Botha & Jenni Baxter are interviewed, as well as selected participants from 'The Expat Confessions'. "The brutally honest account has surprised and even shocked the authors, Ted Botha and Jenni Baxter." "The book introduces topics that could form the basis of a hundred lively debates and at least a few doctoral theses. But it remains a light-hearted book with a subtle, unforced humour that leads to frequent nods and smiles. It makes a great little gift useful for killing a few hours on the plane." How green is the grass? "Ted and Jenni's book is a delightful reflection of South Africans' lives abroad." Lisa questioned Ted and his co-author, Jenni Baxter, about their new collaborative book, 'The Expat Confessions'.